Product prices and availability are accurate as of 2019-04-13 07:47:20 UTC and are subject to change. Any price and availability information displayed on http://www.amazon.com/ at the time of purchase will apply to the purchase of this product. 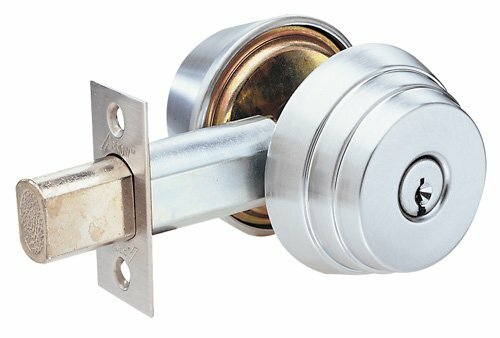 Arrow Lock Occupancy Indicator deadbolt, available on the E Series grade 2 arrow deadbolt. Provides privacy control by utilizing large external viewing window that signals when the room is occupied. The arrow occupancy indicator uses an emergency key override to unlock the door from the outside in case of emergency. When the deadbolt is in the locked position, as external slot is exposed that provides for the use of the override key. When this key is used, the key is captured in the deadbolt and cannot be removed until the deadbolt is retracted or turned to the "Vacant" or unlocked position. This product is ideal for use in restroom facilities and other areas requiring visual notification of use and secured privacy. 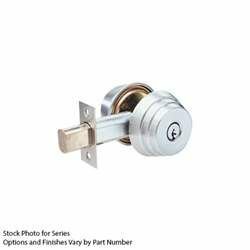 Certification: ANSI A156.5, auxiliary locks, grade 2, Underwriters Laboratories (UL and CUL) listed for use on A label or lesser doors when used in conjunction with a rated primary latching device. Deadbolt fronts: 2-1/4-inches by 1-inch standard for 2-3/8-inches backset, 2-1/4-inches by 1-1/8-inches standard for 2-3/4-inches backset. Drive-in deadbolts are available. Handing: all functions are reversible. Cylinder, standard: solid brass, arrow "A" keyway, drilled for 6 pins, pinned to 5 for stock. Supplied with two keys. Cylinder options: accepts 6 or 7 pin interchangeable cores. Supplied less cores. Will accept Best or Falcon type cores. Finish: stain chromium plated.